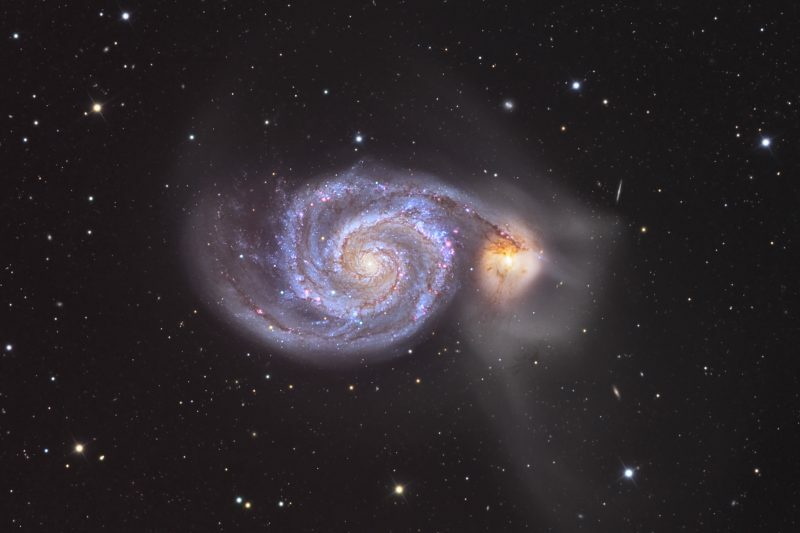 What we call M51 is actually an image of 2 potentially interacting galaxies, NGC5194 and NGC 5195. It is likely that the smaller member, 5195, is further away, since the dust lanes from the Whirlpool seem to cross in front of it. Also note several tiny backround galaxies in this image. Tucked within the handle of the Big Dipper, but actually a denizen of Canes Venatici, not Ursa Major, M51 is one of the most photographed deep sky objects, and my personal favorite since childhood…Who can call himself “astrophotographer” without having conquered the Whirlpool! Technical details are as follows: 16″ RCOS @ f/9, SBIG STL11K, Paramount ME. (HaL)RGB with 15 hrs Lum, 3 hrs/channel RGB, and 7.5 hrs Ha. Processed with Adobe Photoshop. Data acquired at SSRO (New Mexico Skies) in Spring 2008.